Egyptian security forces eliminate 11 ISIS terrorists in northern Sinai, 6 Muslim Brotherhood terrorists near Cairo. Egypt's Interior Ministry announced the elimination of eleven "terrorists" after a gunfight in northern Sinai. According to the announcement, Egyptian security forces received a report regarding a group of terror activists preparing a string of terror attacks in a building in el-Arish. A search revealed that the eliminated terrorists had weapons, two explosive devices, and two explosive belts. Egyptian soldiers and police officers have been working to remove terror groups, including ISIS terrorists, from the Sinai Peninsula. The Asharq Al-Awsat newspaper reported that Egyptian security forces are also increasing their efforts to fight the Muslim Brotherhood, which had planned to carry out hostile acts. 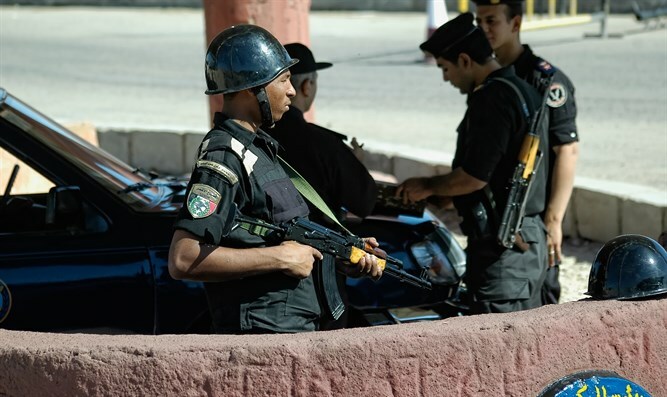 The Egyptian Interior Ministry said security forces north of Cairo eliminated six terrorists from the Muslim Brotherhood. Among the terrorists' possessions were weapons, explosives, and tools to prepare explosive devices.